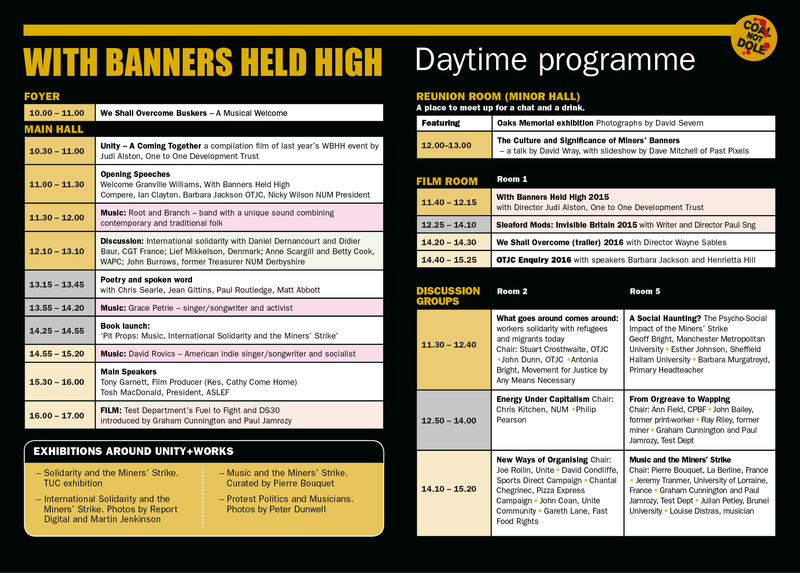 Final day and night time programme for with banners held high. PIT PROPS marks the end of an era in coal mining in the UK and highlights how the incredible year-long struggle by the miners in defence of jobs and communities still resonates today. 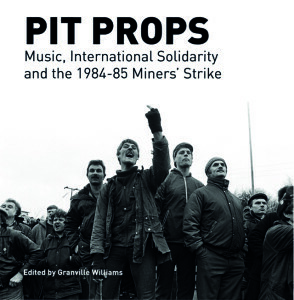 One section focuses on the vital creative links between music, politics and protest which grew up during the strike. Another tells the amazing story of the flood of international support –money, food, toys, clothes, toiletries as well as holidays abroad – which sustained the miners and their families during that year of struggle. The book also deals with unfinished business from the strike. 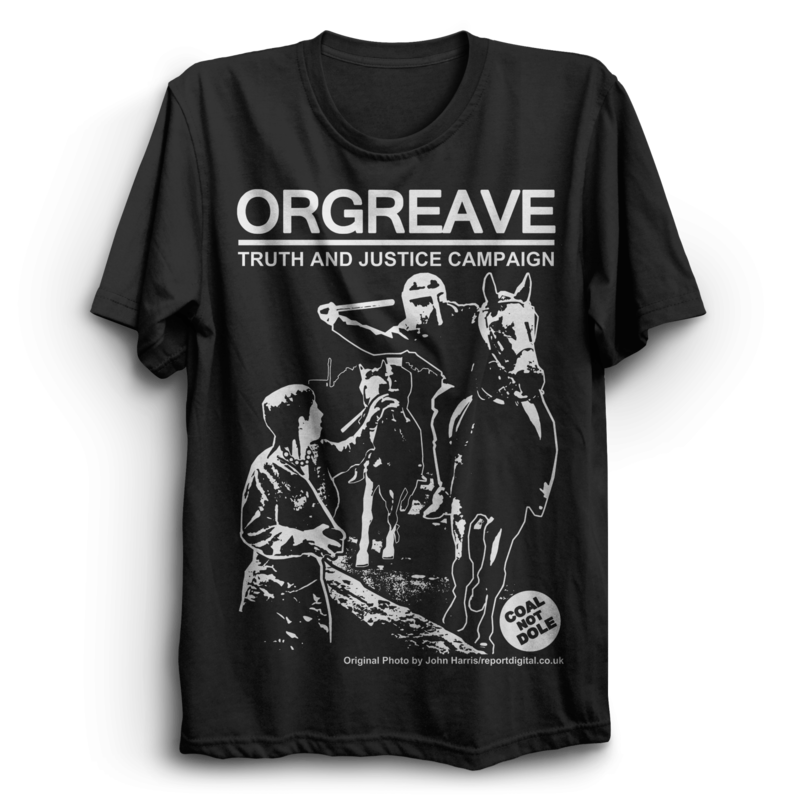 The Orgreave Truth and Justice Campaign is resolute in its pursuit of a full public inquiry into the role of the police on 18 June 1984, when vicious para-military tactics were deployed against miners at Orgreave, South Yorkshire. The former coal field communities, devastated by the relentless pit closure programme which began after the strike, still struggle today. The book concludes with an analysis of the privatisation of the electricity supply industry and how the failure to pursue a coherent energy policy has led to swathes of the industry being controlled by foreign, often state-owned, companies. The absurd consequences of this, now and in the future, are a matter of urgent public concern. Yorks WF9 1EE. 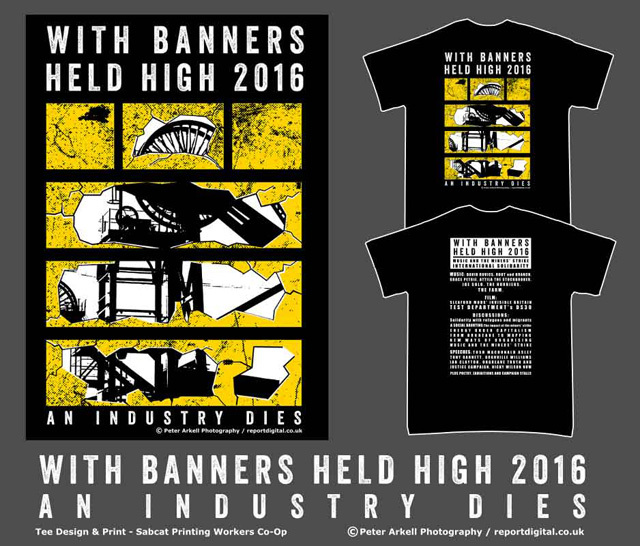 Make cheques payable to ‘With Banners Held High’. Test Dept and their films Fuel to Fight and DS30 will feature prominently in With Banners Held High at Unity+Works Wakefield on Saturday 5 March. 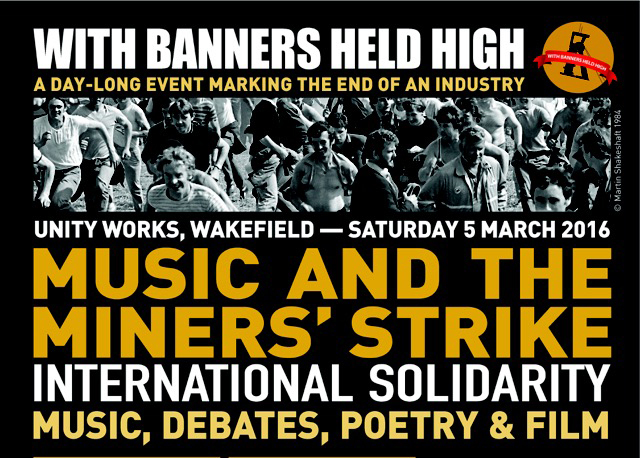 A packed day of music, debates, films, poetry and exhibitions will mark the end of an industry, with the closure of Kellingley Colliery last December. 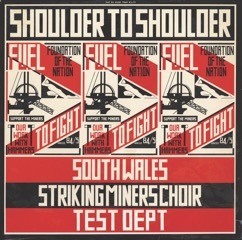 One theme of the day highlights the vital creative links between music, politics and protest which grew up during the miners’ strike.Test Dept produced Shoulder to Shoulder with the South Wales Striking Miners’ Choir during the 1984-85 miners’ strike and organised the Fuel to Fight tour. 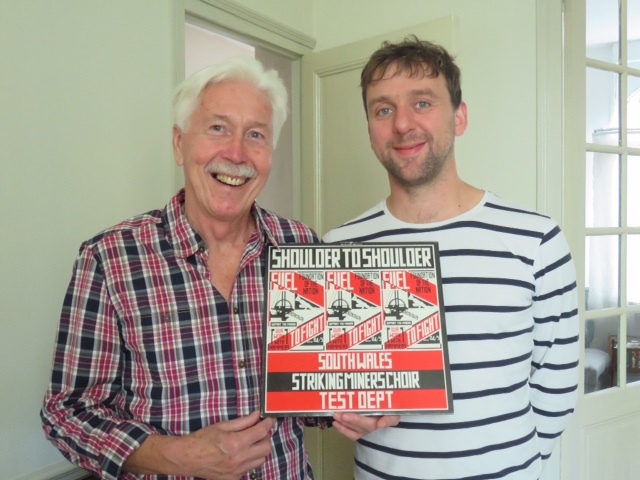 Two members of Test Dept – Graham Cunnington and Paul Jamrozy – will take part in a discussion on Music and the Miners’ Strike and introduce the two films Fuel to Fight (1984) and the stunning DS30, made for the 30th anniversary of the miners’ strike. DS30was first shown on Dunston Staiths, a gigantic wooden structure on the Gateshead riverside, built in 1893 to unload coal from railway trucks onto ships for transport around the UK and abroad. 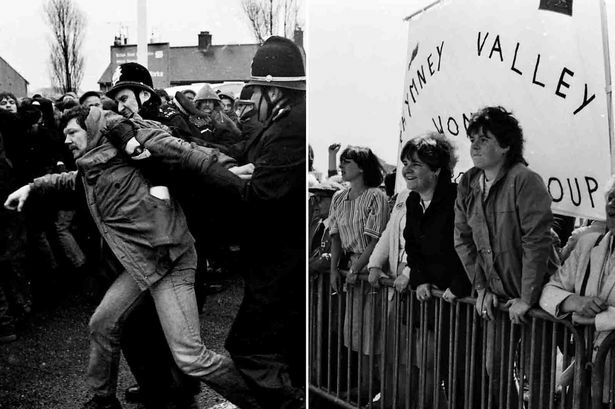 DS30 commemorates the 1984–85 miners’ strike through footage of mining communities culled from national and local archives, set to Test Dept’s own strike-related music. Speakers at With Banners Held High also include the former French miners’ union secretary, Daniel Dernancourt, who will talk about the incredible support French workers gave to the striking miners and their families, Tony Garnett, the producer of Kes andCathy Come Home, and ASLEF President Tosh McDonald. Musicians at the day event include Root and Branch, Grace Petrie and David Rovics. A new book PIT PROPS: Music, International Solidarity and the 1984-85 Miners’ Strike will be launched at the event. from Joe Solo and The Hurriers. Compere Attila the Stockbroker. Twenty six panels created by the TUC Resources Library. Photos by JOHN STURROCK and STEFANO CAGNONI (Report Digital) and MARTIN JENKINSON. 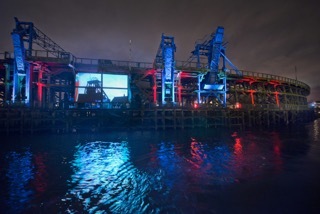 An exhibition created by Pierre Bouquet and previously shown at Rock‘n’Coal, an event held in Oignies, at the heart of the former French mining area, in March 2015. 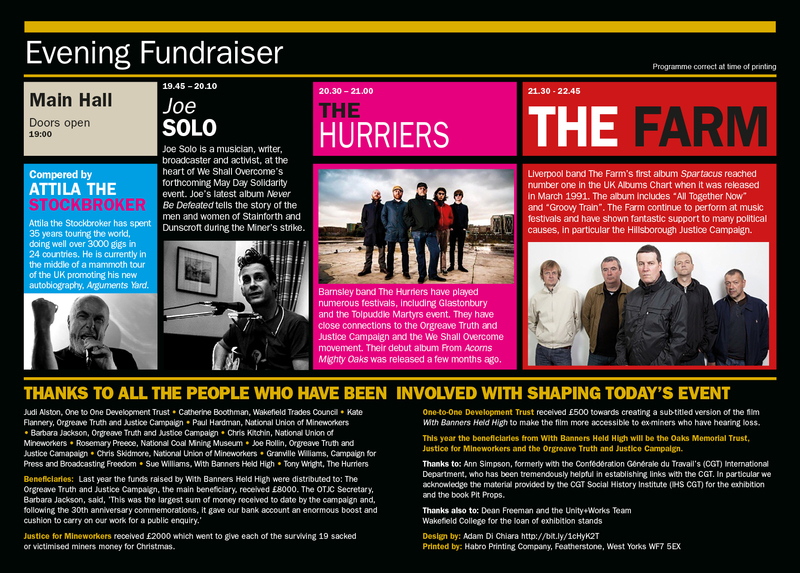 Photos by PETE DUNWELL of musicians including Billy Bragg who link their music with politics and protest. These exhibitions highlight key themes of the With Banners Held High event. One is the inspiring but largely unknown story of the scale and scope of international solidarity and support for the miners in the form of food, money, toiletries, toys and holidays abroad for the children of striking miners. 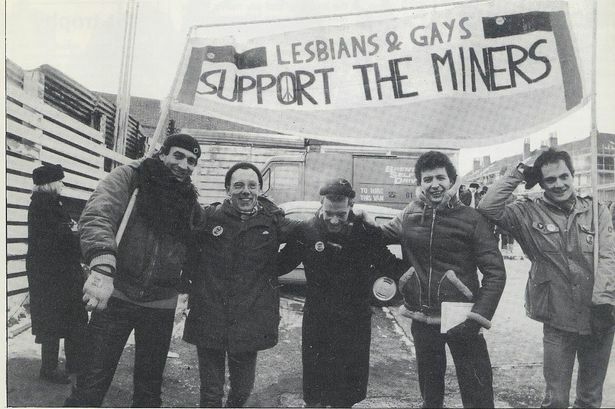 The other is the way musicians supported the miners’ strike. The exhibitions will be complemented on 5 March by workshops and speakers from Europe who were active in this solidarity action. The exhibitions are free and available to view during Unity+Works opening hours. The film follows Sleaford Mods on a tour of the UK in the run up to the 2015 General Election, visiting the neglected, broken down and boarded up parts of the country that many would prefer to ignore. Part band doc, part look at the state of the nation, the documentary features individuals and communities attempting to find hope among the ruins, against a blistering soundtrack provided by Sleaford Mods. A ground-breaking exhibition and film about a little-known aspect of the year-long miners’ strike will come to Wales next year, it has been confirmed.Granville Williams, a journalist and author from Yorkshire who has written and edited several books on the strike, has been researching the level of support given to the miners from overseas.The information he is gathering will form the basis of a touring exhibition that will be accompanied by a film including interviews with those involved. Mr Williams said: “The degree of international support is an element of the strike that you wouldn’t know about unless you were intimately involved with it at the time. “There are some amazing and inspiring stories. Denmark, a small country of four million people, sent two shiploads of food, clothing and money for the benefit of the striking miners and their families. Mr Williams said he would like to make contact with people from Wales who were involved in securing international support for the strike and may have memorabilia from the time, or who may as children have gone on holidays abroad provided by overseas supporters. 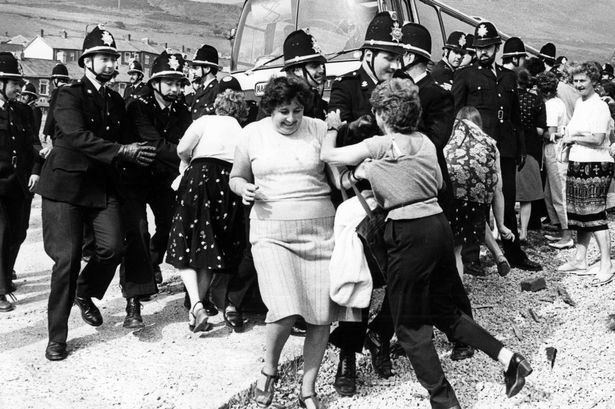 He said: “Striking miners and Women Against Pit Closures went all over the world to explain why they were fighting for their jobs and communities and to get financial and other support. They received a crash course in the nature of trade union international solidarity. “In November 1984 Alun Ifor Jones and Bernard Maslin from Maerdy flew out to Italy for 15 days. Alun Jones concentrated on the northern industrial cities of Turin, Milan and Bologna while Bernard Maslin went south. Between them they raised £35,000. “Another delegation went to Perugia in December for a week’s tour – Allan Baker and Don Canniff from Oakdale and Beryl Fury from the Gwent support group. “Glynis Evans and Eric Price from Maerdy and Carol Price from Nantgarw spent a week in Dutch-speaking Flanders, Belgium and came back with £10,000. DO YOU WANT TO SEE IT MADE TOO? 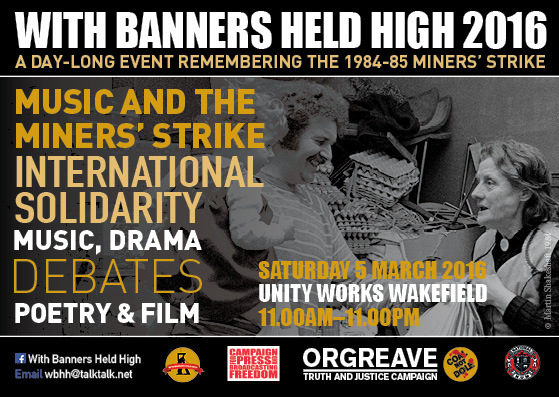 For WITH BANNERS HELD HIGH, to be held on 5 March 2016 in Unity+Works Wakefield, we plan to show the film, create an exhibition and produce a book recording the amazing and inspirational global support for the miners in 1984-85. So below is the link to the Kickstarter campaign for my film “I Get Knocked Down” about what happened to Chumbawamba when they accidentally had that hit single and what we tried to do once we found ourselves in that position! The blurb in the Kickstarter campaign explains what I’m hoping to do with the film so i won’t blah on about it here though I can really recommend watching the trailer just to see Alice Nutter ironing; it is a sight to behold! So, it would be great to show the film at Banners Held High at some point; I would love that. I really hope you can have look at it, share it with as many people as possible and even contribute towards the making of it; that would be lovely! All help on all fronts is most gratefully received. A day long event remembering the 1984-85 Miners’ Strike. 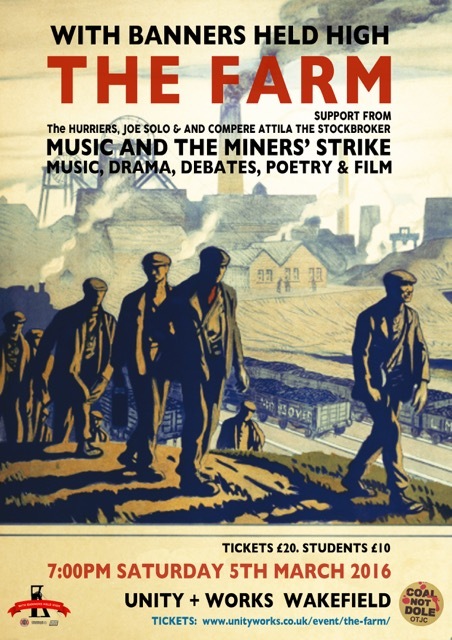 Music and the Miners’ Strike. International solidarity. Music, drama, debates, poetry and film. 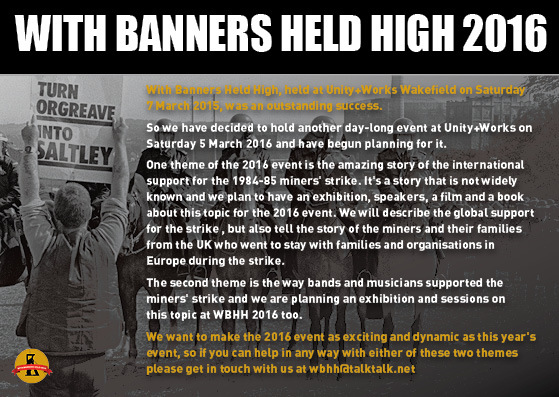 Following the outstanding success of With Banners Held High 2015, we have decided to hold another day long event and Unity Works. Details will be posted here as they are confirmed. 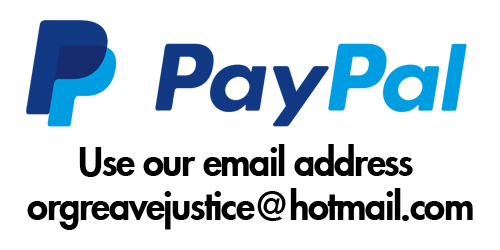 If you would like to get involved, please contact us.